Does your Terminal Emulation software require MDM? Additional Server: Do you need yet another server to simply update your devices? Downtime: Are your devices updated synchronously? Are you losing production time to push updates? Traffic: Do changes require additional software to send countless config files over the network? Security: Are over-the-air updates secure, or are they using unencrypted protocols? Efficiency: How many IT hours are you losing by using additional software to manage software updates? Maintaining your Terminal Emulation environment shouldn't be complicated. Trying to update and operate devices shouldn't require a multitude of servers to perform fundamental tasks that a single-server solution can accomplish. "We understand what a lot of customers suffer from in that regard," says StayLinked CTO, Justin Griffith. "The truth is, a solution that requires an additional software approach to manage and maintain the software is, in principle, flawed. Asking a customer to jump through additional hoops every time they need to update or manage telnet application changes is unnecessary. If your TE solution is relying on another software application to make changes then you've got a serious issue of efficiency." Imagine, for example, you're trying to modernize a host application by creating new optimized screens to streamline your warehouse workflows. Steps might include conceptualizing the interface, design iteration, deploying the application, stress testing the device and application, gauging performance, until it finally reaches the production floor. Once deployed, the application may need further optimization. At each of these crucial steps, you have to ask whether you'd like feedback in real-time versus spending valuable time pushing configuration files to devices with each and every revision. 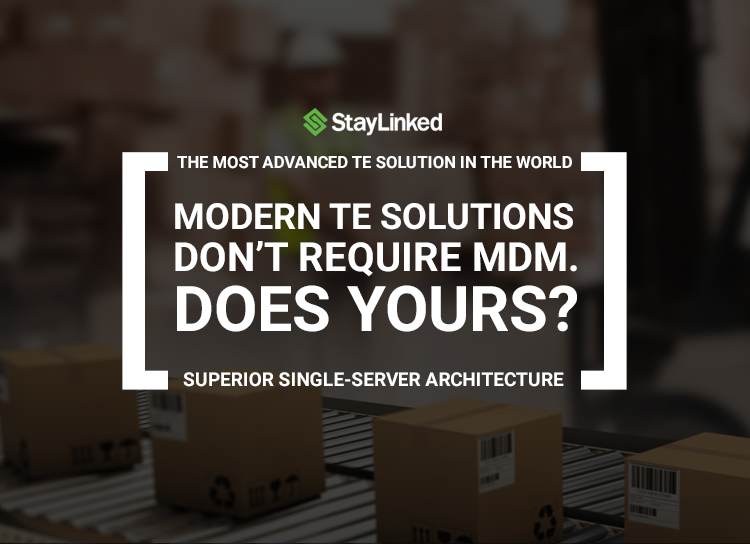 Everything you need for TE in your warehouse can be done with one StayLinked server. That means that installation is easy (less than 10 minutes) and maintenance is minimal. With StayLinked, upkeep is painless and inexpensive, and because it's tightly-integrated, administration is simple. Your Terminal Emulation solution should be built with your production environment in mind. Session persistence is an integral component to the StayLinked architecture. Enterprise data is transmitted efficiently and securely. Session fidelity shouldn't be an afterthought. StayLinked eliminates dropped sessions between the mobile device and the host application. Whether the problem is poor wireless network coverage, mobile device battery issues, or mobile device reboots, the terminal emulation session will never be lost. Sessions can even be transferred to another device or even shared across multiple devices. In fact, StayLinked can even maintain your session over cellular networks when coverage is temporarily lost.